GlоbeCоre is in the business of designing and producing new oil processing equipment and improving the existing equipment. 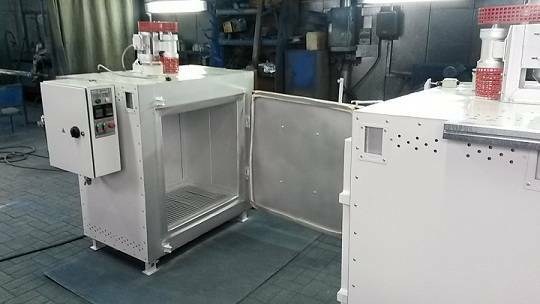 A zeolite drying cabinet is one of the latest developments produced by GlobeCore. The new system is designed to remove water from the sorbents which granulometric sizes are not less than 1 mm. The zeolite drying cabinet is equipped with a circulator fan which provides even heat distribution throughout the entire layer of the substance(s) being dried. The timer maintains a temperature during a set time. Compared with previous models, the ShSC-15B system has the following advantages: (1) the substance(s) may be heated up to 400 ºС/ 752 ºF; (2) the set temperature is maintained automatically; (3) better sealing is achieved due to screw lock; (4) tray units may be removed from the oven, which enable the operators to use this cabinet to warm up or harden material and some units. The zeolite drying cabinet may be fitted with a special element that is heated up to 800ºC/ 1472ºF to meet the customer’s individual order and needs. The temperature control system prevents the operators from burns. For more information on GlоbeCоre and the GlоbeCоre Process, visit www.globecore.com. To order an improved model zeolite drying cabinet, please, contact GlоbeCоre where our management will be happy to assisst you and your staff.